If Mr. Freeman could further remove his racist blinders and study the historical condition of black America, he would find the black community was vibrant and strong 60 years ago. This is not the case today. 60 years ago? What a strange number to use. So Nugent is pointing towards the early 1950s as some sort of Golden Age for African Americans. Obviously Nugent wouldn't say "50 years ago," because slight civil rights gains had already been made by the early 1960s. But there you have it, blacks! Morgan Freeman, you should take off your racist blinders and realize just how great it was to have your own special section, for instance, on public transportation and at (some) lunch counters. There were special drinking fountains and bathrooms and sections of (some) parks set aside just for you! Oh, you had it so good back then! Until, that is, unsatisfied complainers like Rosa Parks, the Greensboro Four, and Martin Luther King, Jr. came along and ruined everything. Tsk. Racism in the Tea Party is not the problem; racism in Morgan Freeman is the problem. African Americans were better off before the civil rights era. African American culture today is neither vibrant nor strong. I'm sure Emmet Till would agree. Any sentence that begins "Ted Nugent thinks" cannot end well. Any sentence that begins "Ted Nugent thinks" is an oxymoron. Any sentence that starts with Ted "Nugent thinks" is a candidate for spell check. My 8th grade teacher would always say: "It's better to remain silent and thought a fool, then to speak and remove all doubt". Someone needs to send Ted back to 8th grade. 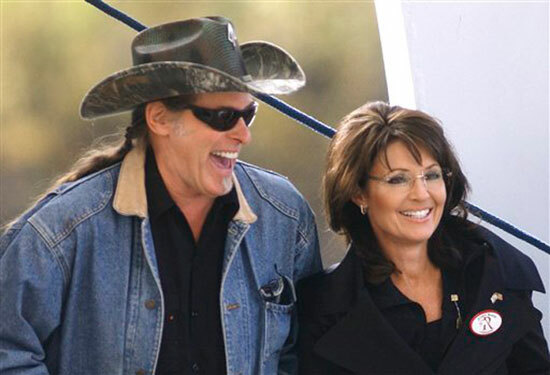 Any sentence that starts with "Ted Nugent thinks" is just like any sentence that starts with "Sarah Palin thinks." Wow, Ted Nugent never stopped getting high, eh? Rock on. I think Glen Rice had it pretty good 25 years ago. Did Ted know that before the picture was taken? Actually, to be fair - 60 years ago, Nugent came of age in Detroit during the years when autoworkers - including African-Americans - were doing well and the city was a prosperous place for middle-class strivers of all races. It was probably the best place in the US to be African-American. It wasn't until the late 1960s - well after Nugent's family moved out - that Detroit declined. So he grew up in the one unique American city where black people were actually doing all right - for a time. A city where black people shaped a musical culture that made it possible for him to make his living in rock and roll, I might add. Doesn't excuse his virulent racism one single bit, but just an interesting historical note and paradox. I thought it said, "Ted Nugent stinks" which I figure is obvs with all the animal killing and whatnot. Second vote for too many fumes of some kind fueling this logic. So Ted would be fine with taking a little poll test on AMERICAN HISTORY the next time he goes to vote? ok. Where did my comment from yesterday go? The comments are truly hilarious - a real treat! Wow Ted Nugent is trying to invent himself AND get a piece of Sarah at the same time? Wonder how he feels about Glenn Rice getting there first - thereby proving the superiority of the NBA wannaBe over the Rock has-been barely was? Why stop at 60 years ago, Ted? Go on back 160 years when those lucky African-Americans didn't have to worry about jobs and mortgages and stuff--because their owners took care of all that. Asshat. Way to be an example those who say marijuana causes brain damage.